Hair oil conditioner that contains essential replenishing oils like coriander, camelina and apricot oils that repair damaged hair & infuse hair with moisture. Protects and detangles hair while reducing breakage. Replenishing oils infuse hair with moisture. 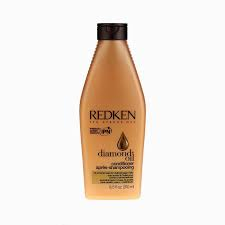 After shampooing with Diamond Oil Shampoo, apply Diamond Oil Conditioner and distribute through hair. Rinse thoroughly. For intensified shine, apply a few drops of Diamond Oil Shatterproof Shine hair oil into the conditioner.